Step 1 In a large nonreactive container, combine the water, salt, sugar, shallots, garlic, lemon zest and bay leaf, stirring until the salt and sugar dissolve to create a brine. Step 2 Add the trout to the container, using a plate or weight to keep the trout under water. Place the container in the refrigerator for 6 hours. Step 3Remove the trout from the brine and discard the brine. Rinse and dry the trout and place them on a rack over a rimmed sheet pan. Refrigerate the trout, uncovered, overnight to dry the surface. Step 4The next day, prepare the hot smoker. Smoke the trout over low heat (about 225 degrees) until firm and fully cooked, about 1 hour. The trout will keep, covered and refrigerated, up to 5 days. In Recipes-list.com we have selected the most viewed recipes from category - Fish and shellfish . Enjoy the best recipes specially selected for you! 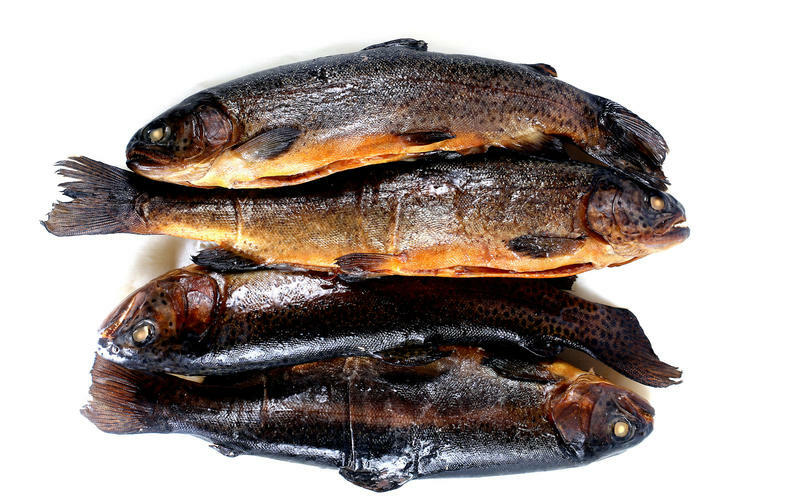 Smoked trout is the right choice that will satisfy all your claims.